Over the past however many years, even as I've stood up for people on the margins and called senators and shared opinions and information, I've still always maintained that there is a way to see both sides. There is a way to bridge the divide. There is a way to meet at a crossroads. The truth is, that meant I was willing to maybe overlook or tone down someone else's racism or homophobia. In the interest of meeting them where they are and hoping to be an influencer to show them a different way. The truth also is that I was scared to ruffle feathers or make enemies or have people not like me. And I was scared to admit that hate is very real. That racism is a thing and white privilege is a thing and violence against women is a thing and hate crimes towards gay people are very real things. I wanted nothing but love and peace and kindness. I am seeing a lot of people trying to find that middle ground now, in the Trump era. And it's admirable. Heck, I still long for love and peace and kindness. But I'm not there anymore. I can't just focus on those lovely things and brush aside or hide from the realities that are around me every day. I'm too angry and fed up, I suppose. I tried to be all nice and crossroadsy before. And there are certainly days when I'm willing to be more patient than others. But there are fewer of those days. Part of me wants to hear the "other side." But part of me is fed up with giving the other side a voice, a chance, a pulpit, a pat on the back. I don't think it's time to bridge the divide. I think it's time to take sides. Trump isn't drawing a line in the sand - he is blowing up a canyon between people in this country. If I try to stand on both sides, I will fall in. I'm usually very willing to see a lot of gray. But when it comes to how we treat human life and how we value one another, it's pretty damn black and white. I'm not saying I won't have the conversations. If people want to engage and truly learn and are ready to leap across the divide to at least visit, I'm all for it. But I'm done tip toeing around in "enemy territory." Again - been there, done that. This also does not mean that I am cutting people out of my life or anything like that. There are people I love dearly who hold very different values than my own. I will keep loving them. And they will keep loving me. But the divide is there. And it's real. The divide changes how you perceive someone, changes how you hold them in whatever level of esteem. And maybe this Trump divide means that some of those people who had been at the crossroads are now standing on the edge of this side of the divide - because they may not fully understand it but they can feel and see that Trump is not good for humanity. But it's going to take a lot of the crossroads people to make an impact by choosing their side. And maybe there are people hiding on that side of the divide - that wish they could be over on this side but they don't want to cause pain or be picked on or be tossed into the divide. Being silent is a privilege. Being silent means you are allowed to turn the other cheek and love your enemy. We like those platitudes in the Bible. We like being able to quote them and hold them up like a shield. Pointing out the rosey, sunshiney parts of our faith. It's time to find your voice, folks. And use it. The Jesus I read about in the Bible did love people. But he loved them radically. He loved the people that others considered disposable and less than. He didn't preach that everyone should embrace the Pharisees and try to better understand archaic Jewish laws. He taught a new way. A vastly different way. This is about people believing they now have license to be openly hateful. Harmful. This is about homophobia and racism and sexism. How those things play out take different forms for different people. But we're at the foundation of the issues. The baseline of choosing the value of people or choosing the value of power. Choose people or choose power. That's it. And with that as the divide, I choose people. Jesus chose people over power. He admonished the powerful and the rich. He healed the sick and broken and embraced those who were "less than." When the new year started, I shared that I wasn't so much into the idea of making a resolution or setting a "focus word." Instead, I made a list of things I wanted to focus on, continue, or start up. 1. I have to admit, I thought I was cheating a little with that first one. When I made my list, I had a plan for Jeff and I to sneak off for 1 night at a hotel. But then the kids got sick. So now I have to find another night when we can book a hotel and sneak away! 3. We are looking at plans for Spring Break. Gatlinburg, I think! 7. After next week, all 4 of us should be on our final belt before becoming Black Belts. Teagan will get there well ahead of the rest of us. And she will certainly continue her training while the rest of us will be satisfied with the achievement of Black Belt. 8 and 9. I need to make a plan to focus on this one in Feb.
10. I've been thinking about this one. One thing I want to get more deeply involved in is fighting homelessness in my city. 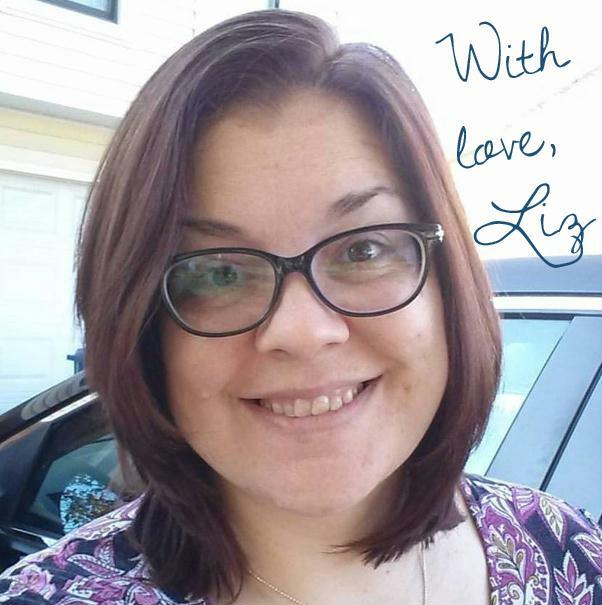 I am involved with a mission through my church but want to look into doing more. 11. This one is slow. I'm trying to get out and walk regularly. I am a wimp when it comes to walking in cold and wet weather, though. 12. I need to work up some courage on this one. 13. We had a date night - the overnight ended up just being dinner in celebration of Jeff's birthday. Need to plan a February date night now! 16. 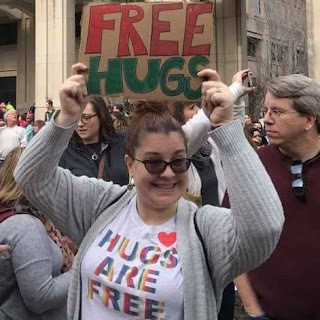 I did Free Hugs at the Indianapolis Women's March (Rally)! It was fantastic! One guy gave me a huge hug and then borrowed my sign so he could go hug people. Another woman hugged me and then handed me her hat (one of those infamous pink knit ones). A couple people would hug and dance at the same time! One event down, 2 to go! 17. I have read 2 books so far - A Dog's Purpose and Born A Crime. I have also been invited to join a book club and am working on forming a book club between some families! 18. I've been doing this one - especially loving a journal I'm doing with Teagan. 19. I've had some lovely time with friends - some highlights are coffee with a friend, a night watching Beaches before the terrible Lifetime redo came on, and a game night with another family. 20. We have a new chore system in place and it's going very well so far! 23. I've been wearing my FitBit almost daily. Sometimes I forget it for a day when I take it off to charge it. I really need to up my daily steps. Making progress in some areas - not bad for the first month of the year! I plan to do monthly updates to keep myself accountable. My kids do not have regular chores. We've tried here and there but it never sticks - mostly due to failure on the part of us as parents to follow through on rewards or tracking. We've been most successful in the summer break when we have a nanny and the kids are required to do chores in order to earn screen time for the day. But when we try to use the same idea during the school year, it fails. Mostly because there are many days where there is no time for personal screen time anyway. For 2017, I am trying again. In our home, we do not pay for chores. And we will not be earning personal screen time by doing chores. Instead, this approach to chores is about the family being a team and everyone having responsibility in taking care of our living space. The reason I think chores are important is because I do see positive growth in my kids when there are daily expectations - read for 20 minutes, do chores, get physical activity. They like having responsibility, they like achieving goals. I don't have strict rules about how the chore gets done. If you've done what's on the list, great. If you do more, even better. You can team up and work together. You can ask for help from a parent. You can do it in the morning or after school - as long as it is done before bed (exceptions include taking care of Bandit and taking out trash bins - those have to be timely). I created calendars - 1 for each child and 1 for us (Mom & Dad). I created a list to explain what each chore is. The basic idea is that the daily chore should only take about 15 minutes of actual work but should make a big impact in how we keep up our home. I used the provided calendar template in Excel. Nothing fancy. The calendar for the month is posted on each child's bedroom door and the list of what is expected for the chore is posted in a common area (we have a specific space in the hallway). Over the course of 2 weeks, each child will have done each chore at least once. Sundays are a day off - except for feeding the dog, of course. I am hopeful that this will be a clearly communicated way of getting basic housework done and creating a sense of teamwork in our family.